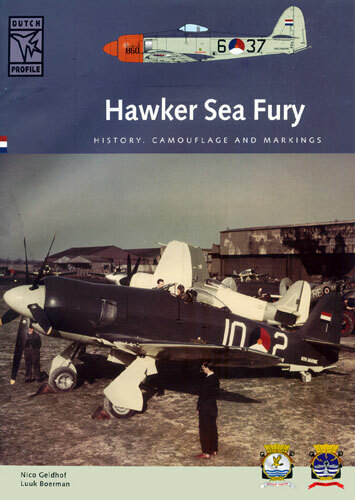 Advantages: Book: Interesting story of an overlooked aspect of Sea Fury in Dutch service; plenty of helpfully captioned photos; covers history, operations, camouflage and markings; full text and captions in both Dutch and English. 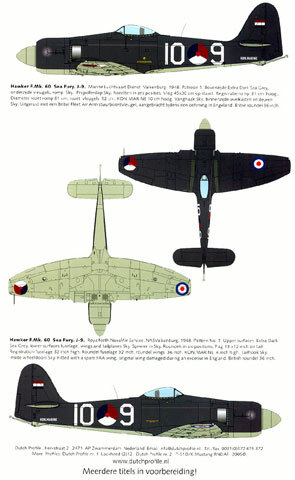 Dutch Profile originates from Holland and the company produces both decals and books dealing with aircraft in the service of the Dutch armed Forces. With two other books already in print (Lockheed L-12/212 and the P-51D/K Mustang) the Sea Fury is their third product. The book is printed in both the Dutch and English languages with the first 18 and half pages in Dutch and the remaining 18 and a half pages in the English language. Photographic captions are in Dutch (first) and English. The translation is done well although a few spelling mistakes have crept in! The book follows the history of the Hawker Sea Fury in Dutch service from its introduction in 1948 until its withdrawal from service in 1956. The coverage is comprehensive and covers the entire history of the Sea Fury including the license built machines. The photographs used in the book are excellent from both a record point of view and a modeller's detail view. Crash pics abound. So what you say? Well, crash pics were usually taken by trained photographers as a record for the inevitable investigation and as such are sharp, clear and well composed – just what the modeller needs! The book is A4 in size and comprises 36 pages of good quality glossy pages containing four colour photographs and 75 black and white ones. Colour profiles are also provided to illustrate the markings worn by seven different machines. More than just a record of operations and use, the book provides nice clear photographs and information on the colours and markings worn by the Sea Fury in Dutch service. The illustration showing the front cover of this book is a little discolored. This is not a fault of the publisher, it was caused the book being exposed to water in the mailbox!